This Norman Rockwell painting, Christmas: Santa Claus Reading Mail, appeared on the cover of The Saturday Evening Post published December 21, 1935. This remains a timeless favorite of all Rockwell collectors, no matter what their age. Alternate titles are Santa at His Desk and Letters to Santa. This Norman Rockwell Santa Claus painting was the 162nd of 322 published Norman Rockwell Saturday Evening Post cover and the seventh of seven in1935. This painting was Rockwell's sixth picture of Santa featured on the cover of The Post. Rockwell's first Post Christmas cover appeared on December 9, 1916. The original oil on canvas painting, 35 x 27 inches or 89 x 68.5 cm, is housed in a private collection. The original painting sold for $657,000 on November 28, 2007 at auction by Sotheby's in New York City. The sale exceeded its pre-auction estimate of $400,000 to $600,000. on page 131 of Norman Rockwell, A Definitive Catalogue by Laurie Norton Moffatt. In fact, when envisioning the jolly old elf, most people see him the way Norman Rockwell painted him. And to think the original copy only cost five cents! Well, we already knew that Santa works very hard. Here Rockwell gives another glimpse into Santa's pre-Christmas routine. One has to wonder what volume of letters to Santa yhat the Post Office handles each year. Also when does it start? If one wanted to be Santa's first letter of the year, when would the letter to Santa need to be mailed? Should the letter be sent Registered Mail to see who signs for it? I mean, who is the head elf nowadays anyway and why doesn't he handle the mail for the big guy? Santa has several huge stacks of letters on his desk. According to the publication date, December 21, both Santa and the children are fast running out of time. The deadline is approaching. In only four days, he will be loading the sleigh. Looking almost like a bookkeeper, Santa is dutifully recording each child's Christmas gift wish. Notice how thick his ledger is. Santa looks like he is trying to de-stress a bit. He is enjoying his pipe. Of course, smoking tobacco is hardly politically correct nowadays. However, in 1935, one was mostly responsible for and to oneself for any injury to one's own body. The elves probably hadn't yet complained about the health risks of second hand smoke and increased health insurance premiums. It also looks as if he is scratching his head with the quill pen. No doubt, Santa is wondering how he will finish on time. As if the pile of Christmas letters to Santa on top of the desk wasn't enough, there is also a satchel of mail sitting on the floor. That bag is only the U.S. Mail. We can only speculate on how many more mail bags from how many more other countries are waiting to be read and catalogued. 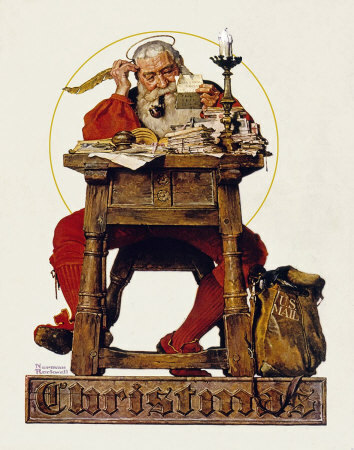 Christmas: Santa Claus Reading Mail was only one of 322 Norman Rockwell Saturday Evening Post covers; Here is the list of Norman Rockwell Saturday Evening Post cover illustrations. Two of the details that stand out are the very sturdy antique desk amd the candlestick. Santa must be reading during the day because he has not lit that candle yet. Santa really is earning his halo, isn't he? Just like any other year!